Let’s go back a little way…. all over again and just the walk along the beach, the familiar paddle out spot, the paddle to the peak all added to the stoke. have been rekindled and new friendships are being formed. Back in 1992 on a SA Kneeboard team tour to Australia I won a new board. This is the board I am still riding today – 22 years later! Father’s Day this year I received the following card from my 11 year old daughter, together with some of her pocket money. Gulp. shaped more than 25 000 boards over many years. fixing dings and sometimes thinking we were making world class boards. 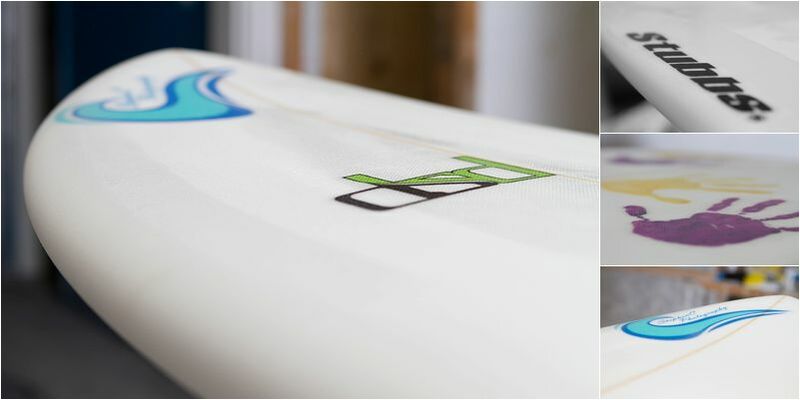 unfolds through to my first surf on the new board. Hopefully I’ll get one of the local photogs to get a pic of my first wave. That would be cool. 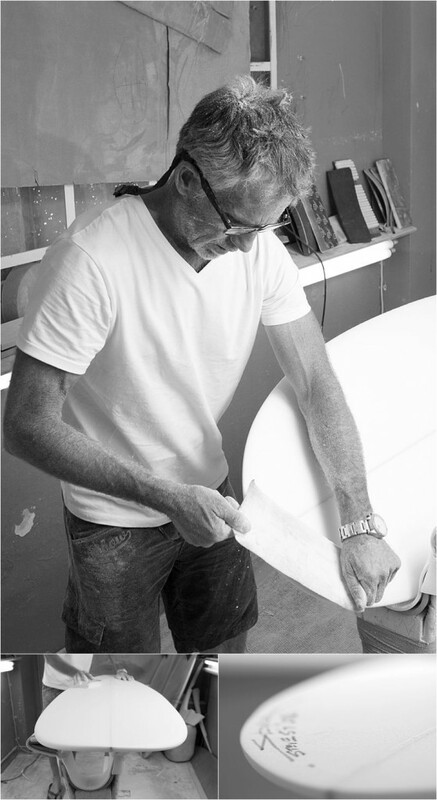 The blank fresh out of the shaping machine and waitng on Dave to hand shape the rest. Dave Stubbs shapes his 25000 and something board. 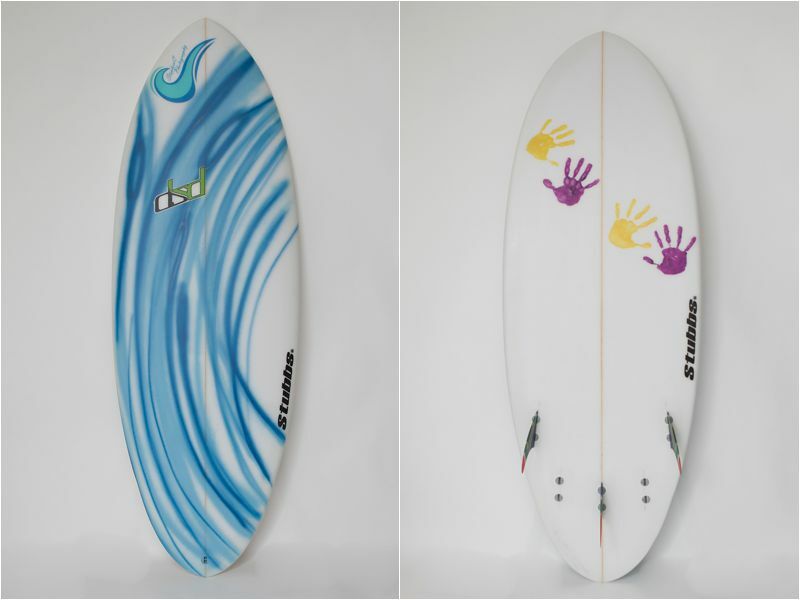 Coming back to the piece above where I mention my daughters’ “incentivising” me to place the order for my new board. They were as excited as I was and I really wanted to have them represented some way on the board. Pink unicorns and loom bands did not quite sound right so I decided to go with their hand prints. 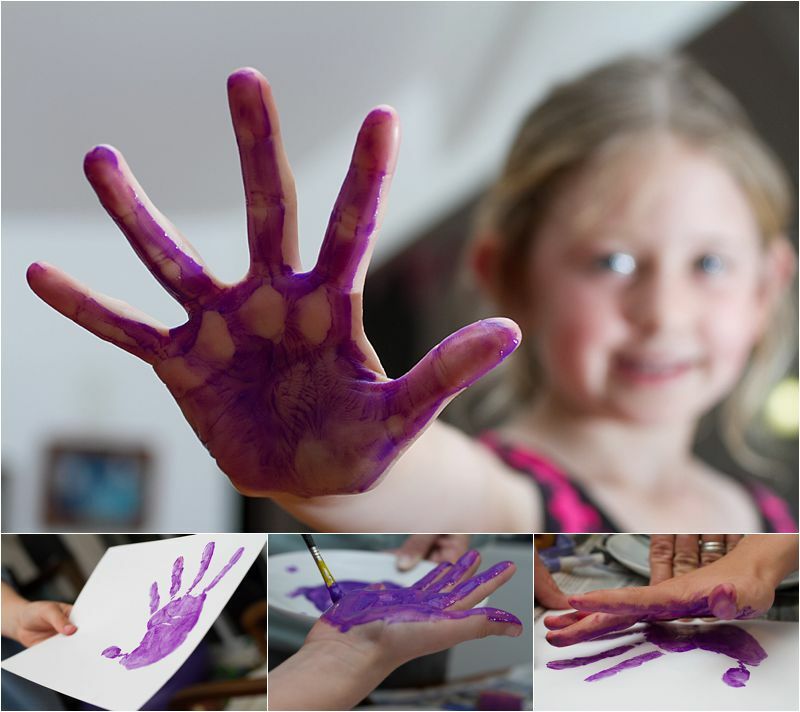 We painted their hands, pressed them on to white paper which I then photographed. In Photoshop Lucinda made the backgrounds transparent and then Dave Jenkins of SurfLab printed the results out on rice paper. These were then glassed into the board by Caution, the DSD glasser of many years. Tabi and Jaed’s hand prints glassed onto the underside of the board. And the end result delivered. The waves for my first surf were fairly small at Kalk Bay on a mid tide, nice and glassy. Glad to say I waited for a set and got a barrel on my first wave – nothing epic, however it was enough to give me confidence that the board would suit me. After that the board just felt better and better on each successive wave so I’m now even more keen to ride it in better surf. Thanks to Billy Ackerman who interrupted moving house to get a pic or two of the session. And a little off the top…. So not only do I get a new board, i also get new fins and am able to chop and change fins with the easy to use fin system. 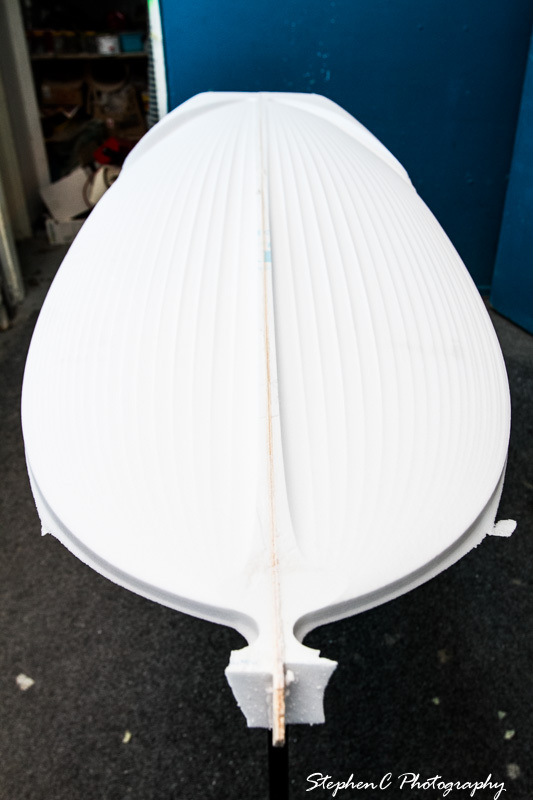 I visited Ross Lindsay of Scarfini Fins and have tested a few fin designs from them. I recently used a smaller, wider fin as my centre fin in some biggish onshore surf at The Reef. Wow, it made a significant difference. So much drive and the board was even more responsive and blasted off sections with delight. 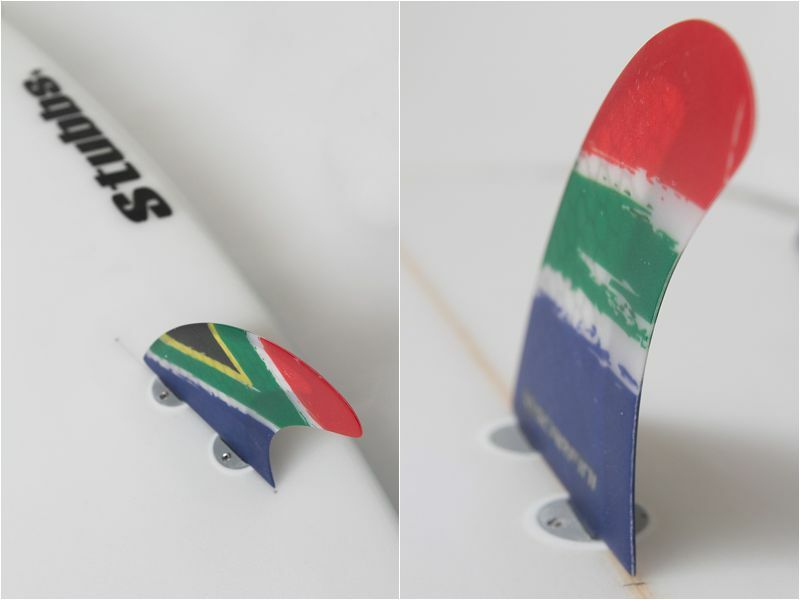 I then used the same fins as a quad and rode the board at Dunes (heavy, hollow, fast wave). The drive down the line was brilliant. Besides enjoying the new board and being back in the water at every opportunity I am also loving rejuvenating old connections and making lots of new connections along the way. And I’m not only making connections with fellow water users – being a pro photographer I’m connecting with loads of photographers as well. And it just so happens that Kalk Bay is one of the most photographed surf breaks in all of South Africa so I’ve pobably got more pics now from the last short while compared to all my 40 years of being in the water. 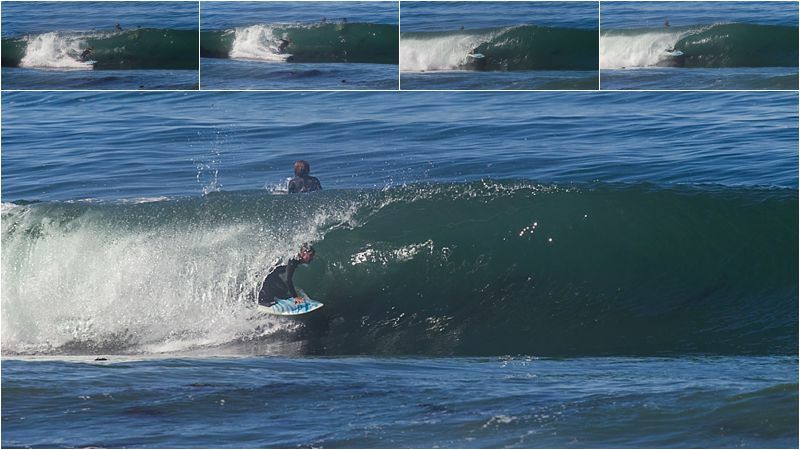 The sequence below was captured by Billy Ackerman during a recent session at….The Reef. What can I say? Loving my board, loving being in the water, every minute!